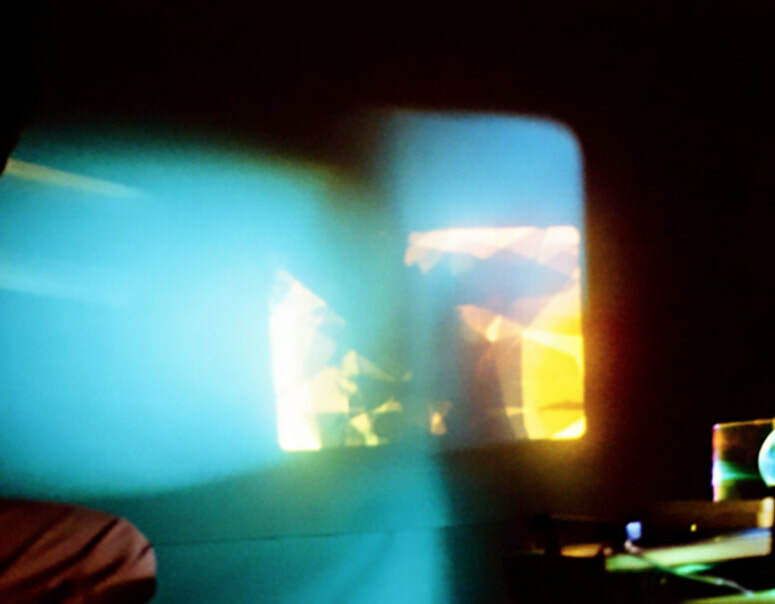 Fovea is an experimental cinema performance. Images and sounds are produced live. The moving images are created from two static light sources outof slides projectors. creates variation of light movements. Inspired by phantasmagoria performance and optic tools she plays with the projection with color filters to go from a white screen to an explosion of vibrations of colors. The images are carried and rhythms by the increasing intensityof the sound. Boulier plays on loop his sounds added on top of each others and playing with stereo effect. audience in the entire room. Together they produce an abstract psychedelic cinematic experience made from scratch. An homage to proto-cinema show and psychedelic music. Emmanuelle Negre and Geoffrey Boulier present «Fovea» a cinematic performance group from France. Emmanuelle Negre is a visual artist and experimental filmmaker graduated from fine art and working with both analogue and digital technics. Geoffrey Boulier is a musician playing multiple instruments, composing and producing psychedelic music. Both met in underground art and music events in Nice and decided to combine their interest in live performance to create their own show.